Blogs ! Blogging !! Bloggers !!! You’re well acquainted with those terms I guess. Are you also willing to join the moving train ? Yeah, it’s a nice idea! Maybe you’ve had a different mindset that those Blogs you see on the internet are just full of valueless articles and the Bloggers behind them are only working for some big companies thereby earning only few dollars a month. I once had the same mindset, which is not exactly like that. There are different types of Bloggers, some are newbies – they are just getting familiar to the blogging environment thereby they spend time and money hoping for positive results as soon as possible, some are average bloggers – they get a tangible amount of traffic, page views and they make a reasonable amount of money with their Blog, then next, we have the Probloggers – they earn 5-6 figure income monthly, yeah, I mean thousands of dollars and most of them are well known in the Blogosphere. Finally, we have the Multi-millionaire Business Bloggers – this very few group of Bloggers have turned their Blogs into a big grown business, a company where millions of dollars are being generated annually. As a new or existing Blogger, it’s up to you to decide which category you want to end up in. 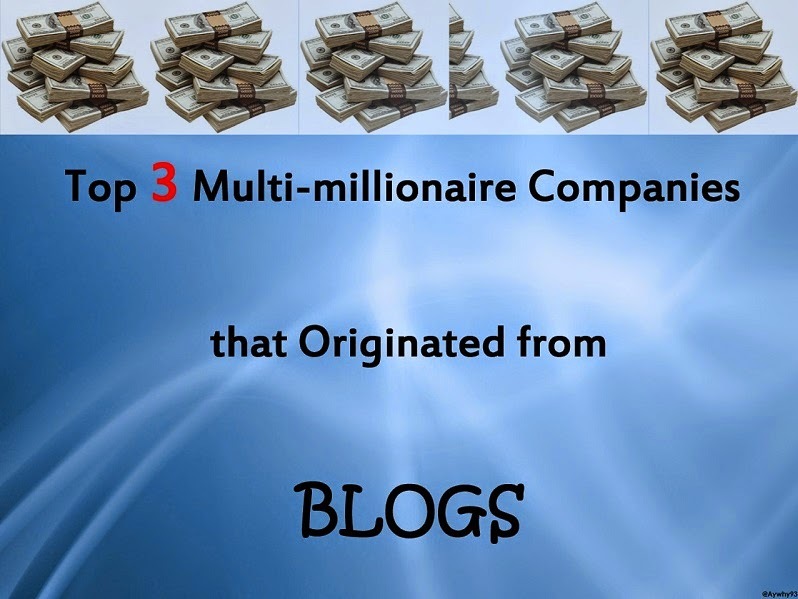 In this post, I’ve decided to share with you the top 3 multi-millionaire businesses/companies that started their life as a mere Blog. Sitepoint.com started as a blog in 2008 and was originally owned by Matt Mickiewicz. Presently, a big graphics design company – 99designs has now originated from Sitepoint. The Matt Mickiewicz inspired blog led to the creation of 99designs when the designers in Sitepoint.com community started a graphics design contest, competing with themselves as one of the best graphics designers. Right now, 99designs is a 64-person company and it is also the largest online marketplace to outsource graphics design in the world. -> Brief – 99designs emerged as the best graphics design marketplace in the world just because they had a big existing audience i.e. SitePoint.com. You’ll agree with me that it’d have been very difficult for 99designs to achieve this success at that short period of time if they never had a pre-existing audience, which means they would have to start from nowhere. -> Lesson – No matter what the nature of the business you’re planning to start in the nearest future is, I'd advise you to start a blog now, so that when you are ready to launch your business, you’ll already have an engaged audience and the direct access you have to your audience might end up turning them to your first clients. Copyblogger.com was a mere blog, started by Brian Clark in 2006. Before he started this blog, he was an attorney yet he hated practicing law, that’s why he followed his mind and started doing what he was passionate about – ‘writing’ and ‘creating useful content online’ on the “Internet”. Presently, Copyblogger.com is now under (and simply known as) CopyBlogger Media, which is a 20+ person company owning various online services and properties which includes – StudioPress (creator of one of the most popular WordPress framework – “Genesis”), Scribe, Synthesis and many more. -> Brief – Brian Clark used his simple and successful blog to launch several other blogs, services, and companies. No wonder Copyblogger Media (the parent company of all the online services, brands and properties which started originally from Copyblogger.com) is now a multi-millionaire company. Imagine that Brian Clark stuck only to CopyBlogger.com, he wouldn’t be as successful as he is today and maybe there wouldn’t be a company named CopyBlogger Media. -> Lesson – Use your Blog as a platform to launch other businesses, when you have a successful blog, don’t just sit down and relax because it is successful, launch other blogs, services or businesses from it and you’ll realize you’re already turning your blog into a multi-millionaire company. Quicksprout.com was started by Neil Patel in 2007 and he published his first post on the blog in April that same year. Before Neil started Quicksprout, he had difficulties making money online. Even after he started Quicksprout, he was still occupied with some other projects (Crazy Eggs and some sorts of softwares) just to ensure the success of his business. Finally, from Quicksprout to -> Crazy Egg and then Crazy Egg to -> KISSmetrics. Yeah, KISSmetrics is the end product of Neil Patel inspired blog - Quicksprout.com. Presently, KISSmetrics is a 27-person analytics company and also, the most sought-after SEO consultant company in the world. -> Brief – At times, things doesn’t seem the way we expect but we don’t have to give up when it happens like that. Neil made a small fortune through his marketing consultancy business, but still he didn't like the work so he dived into the software business instead, which he liked, and succeeded at. This shows how important passion, patience and commitment is when we are into any online business. -> Lesson – Please, don’t get carried away by blogging alone. As you are into the blogging business, open your eyes wide open, think outside the box and come up with a tool, software, app or something else that will be very useful for your audience, and at the same time, that will bring a very high return on investment. Well, as explained earlier in the post, you’ll see that Blogging has a very high return on investment (ROI) when compared to other online businesses. The main reason why the companies above are now multi-millionaires is the fact that they once had a Blog with awesome number of followers (audience) to kickstart their businesses. Get me right, it is not that they won’t be successful if they never started as blogs but it wouldn’t be that fast and possible if otherwise. The main point and summary of this post is that - if you’re planning to start a business or company in the future, start it as a blog now so that when you’re ready to venture into the business fully in the future, you’ll have an engaged audience that will help take it to the next level. What do you think about this post ? Kindly share your thoughts and contributions with us using the comment box and please, kindly share this post with others using the share buttons. Blessings !